Tuesday evening saw us make our first visit to Bona – Sourdough Pizza in Dartmouth Road of up and coming Forest Hill (London). This new restaurant is run by fellow wine writer Andrea Sturniolo and his partner – Kasia. We bumped into Andrea and his partner at one of Havelock Walk's late November Open Days. Andrea told us that they would shortly be opening – planned for 29th December when we would unfortunately be away. 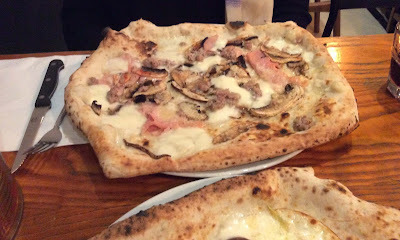 Anyway Tuesday was the first day we could try out the pizzas. They were excellent. We both chose Pizza Biancas. 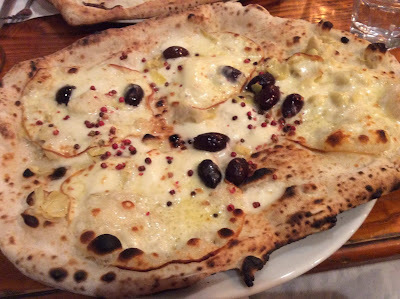 CRM had the Cotto ham, Portobello mushrooms, fennel sausage, Mozzarella and Parmesan (£9), while I went for the artichokes, smoked Scamorza cheese, Kalamata olives, Mozzarella and pink peppercorns (£8.50). 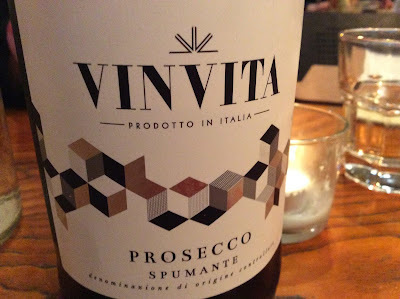 We had a glass of the refreshing Vinvita Prosecco (£5 for 175ml/£18.50 bottle) and enjoyed a very good selection of olives. With our pizzas we drank the soft, easy drinking 2014 Caparzo Sangiovese Toscana (£4 for 175ml/ £15 for bottle). Andrea is very pleased with the way it is going. "The opening night was rammed," he told us. The weekends are apparently very busy. Even on Tuesday there were few spare tables. They had initially looked at premises in Camberwell Green but that fell through and now find it exciting to be part of the changes that are happening in Forest Hill. Italian Andrea Sturniolo moved to London in 1994 and studied for the WSET examinations whilst helping open the London section of the Associazione Italiana Sommelier. 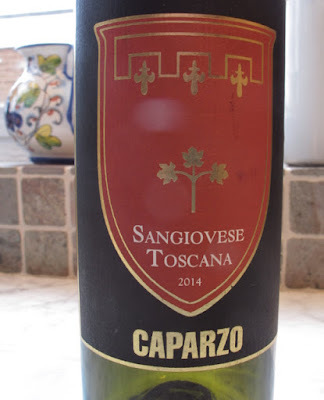 Heading back to Italy in 2002, he set up and taught the wine culture/wine tasting courses at the International Wine Academy of Rome as vice-director, and during this time he began working with an Italian wine guide and various press and web publications. 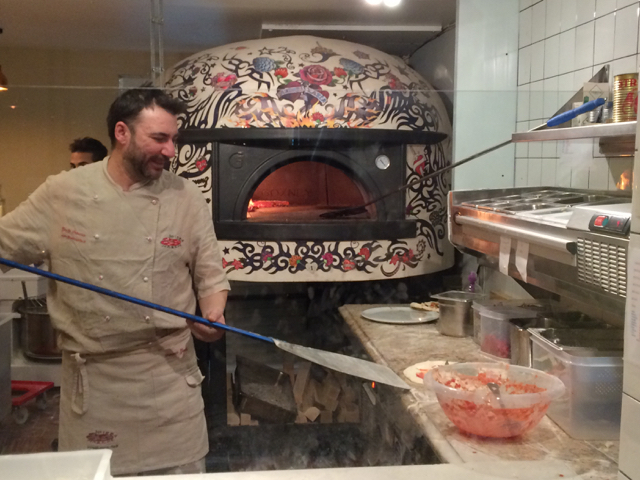 Sturniolo has been back in London since 2006 and has opened his own catering company, Fins & Trotters Kitchen, which won the LLA Street Food Vendor of the Year award in 2013. He is also a consultant for Pall Mall Fine Wine, as well as continuing to contribute to magazines both abroad and in the UK. Sturniolo was first a DWWA judge in 2012. 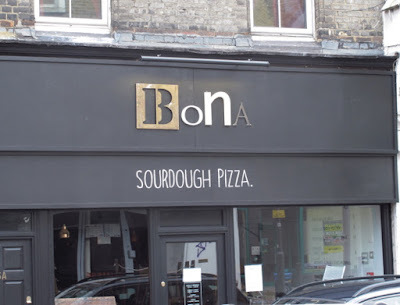 Bona Sourdough Pizza, 25 Dartmouth Road, Forest Hill, London SE23 3HN. Tel: 020-8616 4620. No bookings – just turn up.